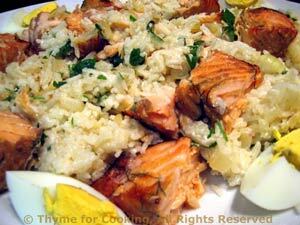 Smoked Salmon Kedgeree, Thyme for Cooking easy gourmet recipes. Butternut squash is another 'large' vegetable, like cabbage and cauliflower, that takes a bit of planning to use completely. Peel it, tonight, scooping out the seeds. Cut off what you'll be using, from either the neck or the bowl end, and wrap the rest in cling film for later in the week. We'll be using it 3 times so adjust accordingly. 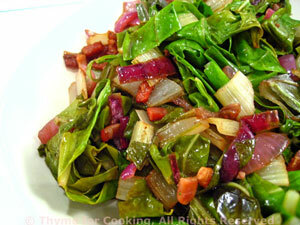 Chard and Red Onion - with a hint of bacon. Greens at their best! Heat oil in a large skillet if using. Add the bacon and fry until crisp. Remove and drain on paper towels. Remove all but 2 tsp fat / oil. Add the onion and chard stems and sauté over medium heat until onion is transparent and chard starts to get tender, about 8 minutes. 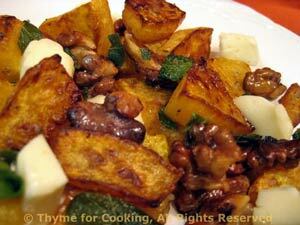 Add the chard leaves and stir until the leaves soften and fit into the skillet. Crumble bacon, stir into chard, remove from heat and serve.